High Quality Silver Accessories - Vivere Rosse | +Win Up to RM3000 worth of Prizes! Hello everyone! Happy Monday! I have said this many times as when it comes to accessories, I love love love bracelet. Anything to do with my wrist. I'm in love! I still remember saw Lisa Suriani wearing this really nice diamond studded bracelet. I try to find it in google but I can't. haha. Then I found an affordable option from Vivere Rosse . Why I love Vivere Rosse? I love how high quality their product is and how exclusive their product looks. I got this bracelet last year and the bracelet still looks new and polished. It is easy to wear and super comfortable on the wrist. Not too heavy not to light in a way it feels tacky like some bracelet I have. The bracelet that I got as shown above is the Cara Tennis Bracelet. It is a 18K White Gold Plated with Finest Grade Diamond Stimulants with Crystal color. More special features this bracelet contains Zircon gemstone that has been said existent for over 100s of years with high diffusion and used to emulate diamonds. Its a great affordable option than diamond. Whatever it is, I am in love with this bracelet! It matches nearly all of my other wrist accessories especially when I pair it with my watches. What you need to know more about Vivere Rosse . Other than bracelet, Vivere Rosse also offers accessories and jewerly such as Anklet, Earrings, Necklace, Rings, Couple Rings, Jewerly Set and more. I love this hello kitty bracelet so much! Cute kan! All of their products are screened and tested to ensure that all products sold in Vivere Rosse are of top notch quality. Which they really are! Also they accept return within 7 days of your order’s arrival in case you want to change it or so. Another points that i love is that they accept iPay88 payment method. my favourite ways to pay and shop online! When you have shop at Vivere Rosse and accumulated RM1000 and above you will become their VIP member automatically. 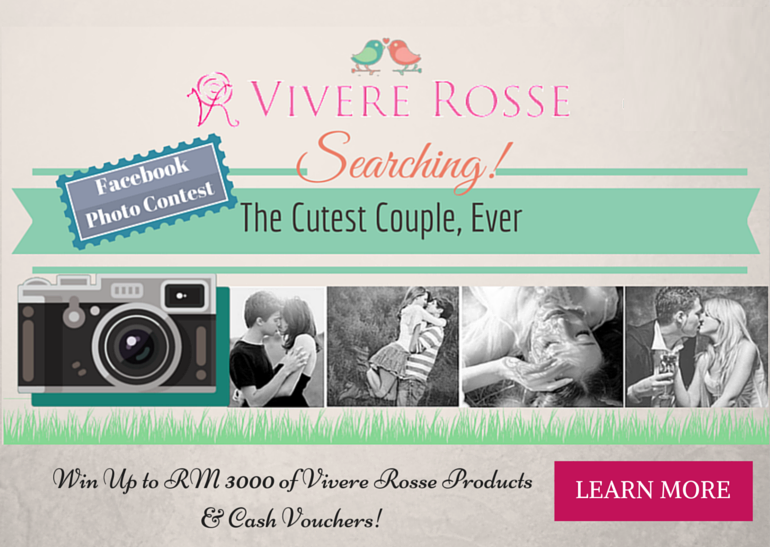 Another great news is that Vivere Rose is holding up a giveaway to the cutest Couple every! Prize up to RM3000 to be won! On top of that 5 voters are able to get RM 50 Vivere Rosse cash vouchers too. Yay! best nya dpt pakai earrings! sab xbleh, cepat gatal hehe. Welcome! kan.. senang je.. hahaha... tp mmg serious gelang dia cantik... quality sama macam pandora semua.